There is no need to sacrifice your home decor any longer while trying to integrate your dog into your home. 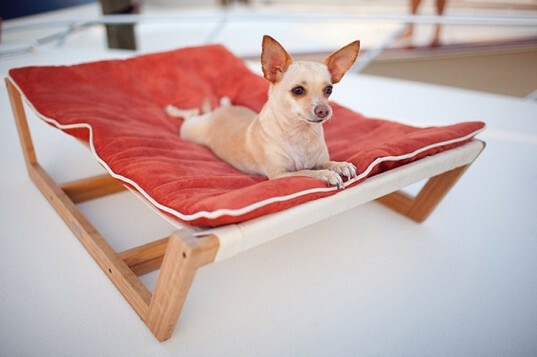 Jumbl Deluxe has done it again with their newest and most refined pet furniture piece ever, the Bamboo Pet Hammock. This incredible design is created with a solid and sustainable bamboo frame, a very soft mattress support system and the high quality removable and washable cushion. Assembling the bamboo pet hammock is super easy. With the help of a screwdriver connect the brackets to the bamboo framing and Voila! The hammock’s metal clips attach to the brackets in a matter of seconds. Once that’s in place, simply spread the cushion and invite your dog to have a nap. The hypoallergenic and stain resistant sleeping surface gently responds to your pet’s weight, encouraging them to stretch and helping relieve uncomfortable pressure points.